A very good quality, mid sized, Victorian copper pipe mould. 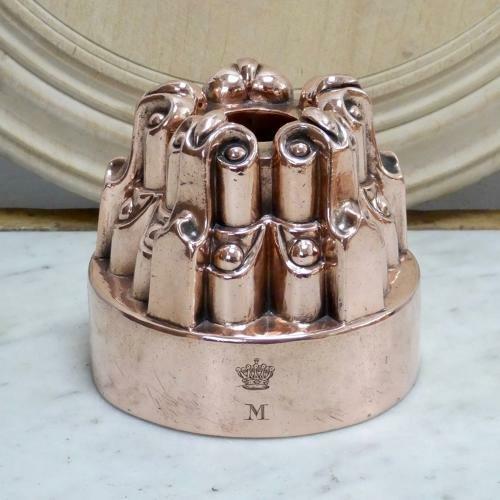 This mould is made from a heavy gauge of copper and it dates from c.1870. It is marked with a number '274' which would be a pattern number and it is also finely engraved with a crown and the letter 'M'. The crown is a Ducal crown and this may relate to the Duke of Marlborough. There is slight denting to the high points of the mould, consistent with use, but otherwise it is in very good condition. The tinning, to the interior, is worn.